The July report is full of great data but as usual we find that the information leads us to mixed conclusions. I've added an additional indicator this month that may be helpful in providing us a clue about the economy's direction over the next quarter or two. The last eight to nine weeks as an investor have been anything but easy. We've seen a mild correction in markets that lasted almost two months suddenly turn into a blistering buying rampage that resulted in the markets pushing to new highs within 7 or 8 days. We've seen Europe appear to be in collapse mode only to be rescued from the jaws of death. We've seen US markets erupt in optimism and rally expectantly into the coming earnings season. It is so important for us as investors to note that the economy is not the market and sometimes it is better to stop being right and simply but a saddle on the beast and ride it. 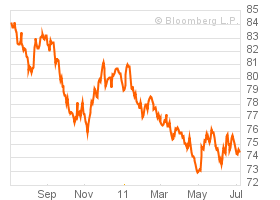 Have I thrown in the towel and dropped the notion that the economy and markets will retest their 2009 lows? Unfortunately the answer is no. But just like I posted in August 2009, there is a time to simply ride the wave like an agile surfer less we face the awesome power of the ocean's fury and get beat to death. Ultimately this may mean that you trade small and look for significant points of support and resistance to enter trades to reduce risk and maximize gains. Please enjoy and don't forget to leave your questions and comments, I really enjoy them. Rail traffic continues to trend higher against the 2010 postings. The week showed gains in every group except coal and autos. Grain shipments were significantly higher. Regular readers know that I often look at individual rail shipping tonnage in an attempt to spot trend changes or relative under or out performance. I wanted to highlight BNSF because it is showing signs of weakness here and beginning to trend below last year's number. Unfortunately Warren Buffett bought this target last year and added to Berkshire Hathaway's conglomerate of holdings so we can't add this railway to our watch list of potential shorts, but heck since BRKA is doing so poorly perhaps we should add it too our lists anyway. The decline in production here in BNSF isn't going to fix problems there. CP and CSX look weak too, but not as potentially bad as BNSF. 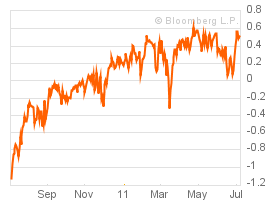 BRKA is posting a negative 3.1% return so far year to date as of 7/7/2011. YUCK! The movement of crushed stone often gives us insight into commercial real estate construction. Crushed stone tonnage is tracking right on par with 2010's levels so I'm not expecting an overwhelming surge in commercial real estate building numbers. We'll look at transaction pricing for CRE later, I'd personally expect to see a ramp up in those prices on existing buildings and then expect to see a follow on as investors and developers take confidence in higher prices. Clearly we aren't seeing any of that. The transportation of chemicals is great to examine as we look at manufacturing in the US and the world. Chemical usage is a barometer of the health of the general economy. So far, the relative position of the amount of chemicals transported is a parallel shift higher than 2010 so things continue to look positive. Over the next couple of weeks we'll need to watch closely to ensure that volumes turn up to keep pace with last year's recovery trend. The April numbers were recently released for the Moody's/MIT Transaction Based Index. This index includes actual commercial real estate transactions for the period. 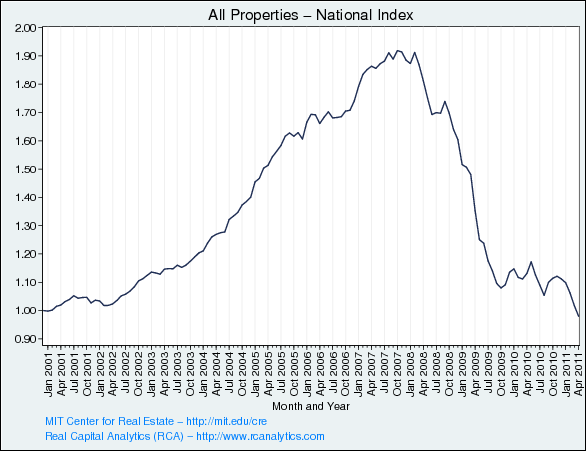 Unfortunately we continue to see that commercial real estate prices in total are falling still. April deal prices notched a 3.69% decline for the month. Just as the MIT data suggests, Costar also reports that commercial real estate continues to fall. While the information is dismal, there are some areas of the nation that are actually showing improvements in transaction price in past months. I wanted to highlight some key points for April CoStar data. Sales volume is rising. Perhaps sellers are finally going to puke out their bad investments from the 2005 to 2007 period where they simply overpaid. In April, 793 transactions were on properties that were "repeat" sales, meaning that this is a great source of data for them to examine real pricing trends. We not only can see price, but can also see when the seller acquired the asset (or liability in this case!). CoStar’s Composite Commercial Repeat Sales Index declined by 1.7% in April 2011. It is now 13% below the same period last year and 38% below its peak in August 2007. Here is the staggering part! In April 2011, over 77% -- or more than 3 out of every 4 of the properties previously bought at the 2005-2007 peak were sold at a lower price. Comparatively, 46% of the properties that were purchased before or after the 2005-2007 period were subsequently sold at a lower price in April 2011. Now we are seeing some traction here. We are seeing an acceleration of the amount of deals that are getting done and prices are falling. Perhaps, just perhaps those banks, insurance companies, and investors have finally decided just to take the loss on these deals and get over with it. If this happens we may see more significant drops in price, but this would be healthy in the longer term for commercial real estate. May average home prices moved up substantially by almost a full 2% from April. Homes sales in the South and Northeast drove the gains. While this move up is great, we are still below the December 2010 average home price of $217,900. WLI data continues to show weakness. Scrap pricing has fallen quite a bit since March 7th of this year. Over the last month we've seen a mild improvement in pricing, but this item should be examined closely over the next month or two. As we've noted often, Alan Greenspan used scrap pricing as one of his best indicators for financial health in an economy. It is very interesting in that context to note that scrap has been falling for nearly 4 months now. The Pulse of Commerce Index continues to flash warning signs to us that the broader economy is not as vibrant as our amazing stock markets would suggest. The PCI has now shown declines in four of the past five months of 2011 and it is clear that rising fuel prices are having a dampening effect on growth. Recall that the PCI is derived from real time fueling data from commercial long-haul trucks. This information is a powerful indication of how much stuff is moving across our nation and how those goods translate into consumer consumption levels. The MEI released this morning continues to show good things are happening on the job front. The index level that measures the number of online job listings hit a level of 146 which is the highest point since October of 2008. I do find it interesting that the annual growth rate on the MEI is only 4% meaning that the improvement is not a great one and the rate of change is falling fast. I would not be shocked to see this report come in lower next month. Oil and gas jobs, utility employment, and mining ventures continue to lead the charge in hiring while public administration jobs continue to get the ax. I've added a new indicator to our monthly list called the Money Anxiety Index. Thanks again Carrz as he is so good at pointing out these cool macro-economic health indicators. Thanks also to Dr. Dan Geller, the creator of the index for allowing us to use the data and charts, we're happy to have one more item to analyze! 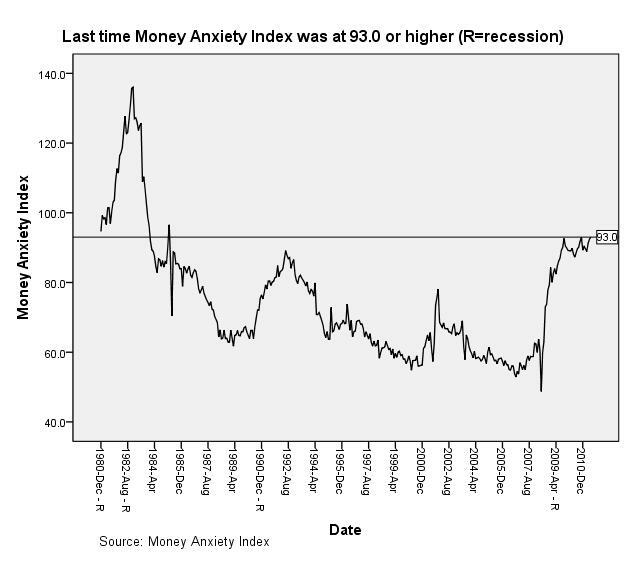 The Money Anxiety Index attempts use economic measures to quantify the human behavior associated with those levels of stress, fear, comfort, or confidence. Since MAI captures early signs of consumers’ financial anxiety, it can be used as a barometer to consumers’ behavior related to various economic activities. The level of consumers’ spending and savings is impacted by the level of financial anxiety. The MAI is at a very critical spot. Based on the data, the anxiety level for consumers is at a level not seen since the 1980 recession. In addition to this, the model also has a solid track record of predicting recessions when the anxiety level increases for 5 consecutive months. As of the end of June we had seen 4 straight months of increased anxiety. If next month's number show more worry, this will be a significant indication of a coming recession. The Coppock Turn Indicator ended June providing us a buy signal for the markets as the DOW roared past the 12,350 level and closed above it. Coppock will stay bullish and long unless the Dow rolls back over and drops to 11,800 by July's month end, which seems all together unlikely. While I include the Coppock for entertainment purposes only, it would seem as though it nailed this last move or got part of it (for once). 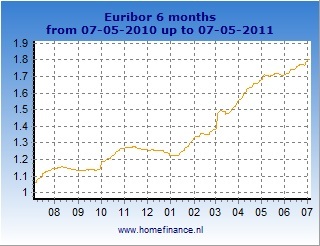 6 Month Euribor continues to move higher and higher. Nothing to see here folks! 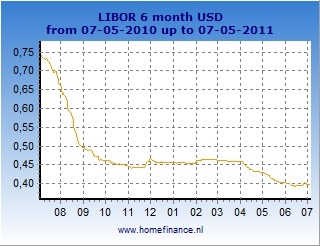 While the Euribor rate is actually fine, it really isn't when compared to the 6 Month USD Libor chart below. My only question is, "Which one of these is mispriced?" Hello, Houston, do we have a problem? 6 month rates haven't even moved up at all which indicate some sort of financial health. What the heck is going on here? We are lower than we were a year ago! Really? Everything is just fine! The FCI was looking very bearish just a week and a half ago and then suddenly out of nowhere a tsunami of stock market liquidity and gains blasted the index higher out of near recession level numbers. The handy work of the last week has revealed that the recession is off the table for the moment according to this market index. Remember the FCI is comprised of data that captures the health of equity markets, bond markets, and money markets. 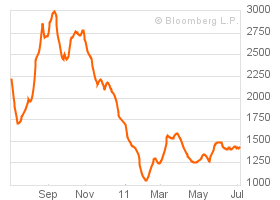 The rebound in the Financial Conditions Index is certainly to be expected after the blow out week we just had. Dry Goods Index prices continue to languish. The oversupply of ships is simply killing these businesses. These guys are a disaster. Have you looked at the charts for DSX, EGLE, DRYS, and PRGN lately? Ouch! Leverage kills doesn't it? The USD continues to fall, but we are at the base that has been trying to form. We'll need to watch the USD Index to ensure that the mid $73.50 level is not breached. If the dollar falls significantly we'll see a pop in all commodity prices and at least initially we'll see stock prices rise as well. Still have some indicators that are flashing warning signs that the overall economy is weakening. The key ones to watch are the PCI, Money Anxiety Index, scrap prices and chemical rail tonnage. The measures paint a broad picture that the rate of recovery is absolutely slowing, if not topping. I will be very interested to see the new numbers posted on the MAI in the coming week from Dr. Geller. I plan to do a post on this later next week, but the European farce is just about to go too far. I have been waiting for the rating agencies to do what they've needed to do and now that they are finally finding their mojo (they are finally evaluating bonds and rating them appropriately for the risk they carry) the EU and ECB are stepping in stating that they will ignore the ratings! In other words all the rules are off to achieve the desired result. The economic and political leadership have used the agencies as useful idiots and now that the agencies now longer are willing to be bought off, there is no need for them. While equities shot up, commodities seemed to be in the crosshairs of those central banker bounty hunters. The IEA's coordinated release of oil supplies looked like it was going to finally break the back of commodity bulls, yet after one week we've seen amazing rebounds in oil and gas. In fact, gas futures are ABOVE the price before the SPR release! As much as I've been a bull on commodities including gas, I am not taking advantage of this momentum move higher. I believe that we'll see a move up and then more downward pressure on everything from oil, gas, silver, and gold. As I was about to finish up this monthly wrap-up I scanned a headline about Warren Buffett and his notion that there will be no double dip recession. Now Mr. Buffett has incredible information about the economy because he sees all of the data for all of the pieces that comprise Berkshire Hathaway. While I noted earlier in the post that BNSF appears to be underperforming last year's tonnage I tend to focus much more when we get talk like this from folks that have big money in the pot at the poker table. Call me a cynic, but I often believe that guys like Warren Buffett are talking their book more than they are really sharing their insight about the direction of the economy, the market, or a specific investment. When I hear the Chairman of Berkshire state something like this, I hear that he needs the market to stay out of a recession or else he'll feel some pain. Clearly Berkshire is leveraged to the homebuilding and construction market with all of his furniture makers, carpet manufacturers, and brick companies. He needs a turnaround in housing to build a base for improving performance. I've shared many times that I find it difficult to believe that home building will be a great place to invest for a while. In my area a new home cost significantly more than the cost of a used home because commodity input prices are so high. Many of those first-time home buyers cannot justify the additional expense to have the luxury of a new home. There is also this little problem of a huge inventory of foreclosed homes that make the competition even tougher. In other words, I don't see the home construction business turning around anytime soon. As for the economy getting back to 6% unemployment within a few years, there's not a chance. Earlier in the rails section I mentioned BRK.A, and how it had turned in a negative year-to-date record so far. Let's take a closer look at the B shares of Berkshire (BRK.B). I like this one simply because it is affordable! In terms of setting up a trade here, I really like the action in BRK.B, and especially find it interesting because of the drop resulting from this morning's employment report. I think this trade could take us easily to a $71 or $72 level for a nice shorting opportunity with an entry here around $76.75. Here are two views of BRK.B that I'm watching. Finally, the Weekly view below shows the 14 Day EMA under the 40 Day EMA, this "death-cross" view indicates that Berkshire has no momentum and validates the notion that it is a potential short. That's enough for now, please continue to check in with us and leave your comments. Have great luck and be careful!